Reuniting with past band members for a song or two seems to be a popular thing to do and Helix‘s long-time frontman and band founder Brian Vollmer hinted today that such a reunion may well occur at the band’s next gig at Maxwell’s Concerts & Events in Waterloo, Ontario, Canada on November 16, 2018. “Yesterday Lynda and I drove up to my hometown of Listowel, Ontario to take my mom out for her 81st birthday. We also picked up her man pal Stan (who we call “Stan the Man“) and headed out to The Roadhouse for lunch. Mom didn’t know we were picking up Stan (it was a surprise) and didn’t even see him in the back seat until she was nearly sitting in his lap. LOL. We had a good time talking & cracking jokes. It made me happy that my mom was happy. At the end of the meal, who should walk in but original keyboardist and member of the band Don Simmons. Ironically, I had just received a Christmas card from Don on Friday. He had sent it to us early knowing that we leave for Florida at the end of November. We had a little chat and I invited him out to our show at Maxwell’s in Waterloo on Friday, November 16th. On the way home I phoned original drummer Bruce Arnold. He’s also coming to the show with his wife Bonnie. The conversation drifted off to other previous members and the bands Bruce has been working with lately. We talked about Ron Watson, the original guitarist in the band and how he has cancer. Get well Ron! 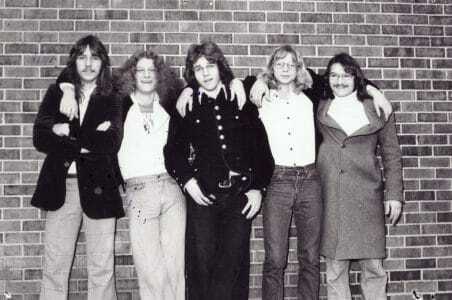 Wikipedia states the following band members’ tenure in the group: Bruce Arnold – drums (1974–1976), Ron Watson – guitar (1974–1975), Don Simmons – keyboards (1974–1976), Keith “Bert” Zurbrigg – bass (1974–1980), Brent “The Doctor” Doerner – guitar, vocals (1975–1989, 1993, 2009–2012) and Brian Doerner – drums (1976–1980, 2005–2006).